As the average farmer in the Maritimes approaches retirement, Atlantic Canada is facing a timely and pressing need to ensure a strong and sustainable future for our regional organic food supply. Through the development of more extensive education and training for this new generation of organic producers, these efforts aim to provide new successful regional operations to enhance and build the community as a whole. The development of the Atlantic Canadian Organic Regional Network’s (ACORN) first ever organic farmer training initiative has been inspired by comprehensive feedback from the Maritime organic sector. The platform is to establish and increase mutually beneficial relationships between beginner, transitioning and experienced producers, as well as to provide and encourage knowledge transfer and skill building opportunities. This exciting new initiative strives to provide far more than just on-farm experience, offering a dynamic mix of formal and experiential education as well as community-building opportunities to increase the capacity of this growing sector. As more farmers approach retirement, ACORN believes they have a particularly valuable role as educators, to pass on their hard-earned farm wisdom and experience to a new generation of organic growers. In return, these important connections will preserve traditional knowledge and foster a strong future for local organic agriculture in Atlantic Canada! This initiative has been developed with valuable input from a diverse committee of ACORN staff, organic producers, organic resource specialists, and other stakeholders supporting the future of new entrant farmers in Atlantic Canada. ACORN’s Grow A Farmer Initiative promotes organic farming as a viable and empowering form of livelihood. With a focus on farmer-to-farmer training, the program intends to cultivate, renew and diversify the organic sector in Atlantic Canada, through the preservation, growth, and use of local knowledge, land and community. To preserve, renew and increase access to farmland in Atlantic Canada. Check out our program brochure here. Take this opportunity to join the growing network of new and aspiring organic farmers in Atlantic Canada! For all inquiries, please see here. 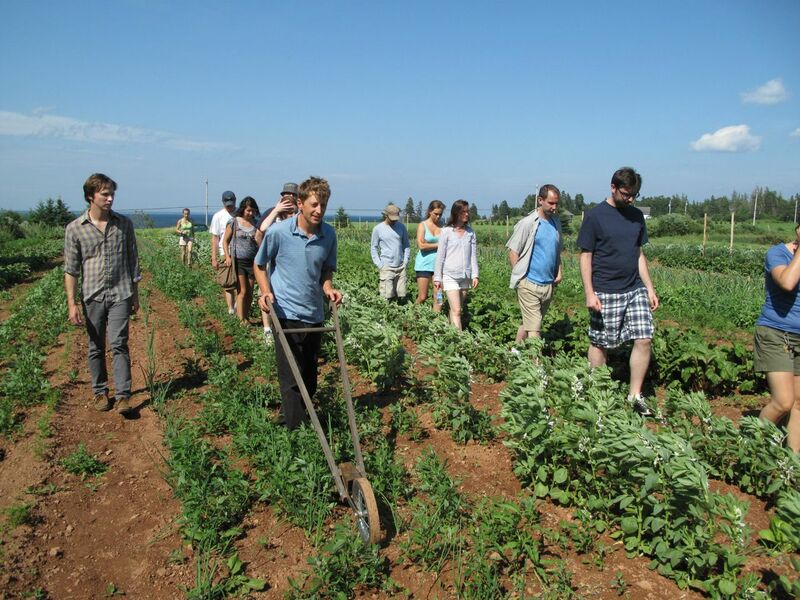 Photo above: Charles Ryan of Wysmykal Farm in Northport, NS, leads a tour of the small organic mixed vegetable and hop farm to a mix of aspiring farmers and gardeners. We host on-going activities supporting beginner farmers throughout the Maritime provinces. Our next would be a farm-tour in September, being held in NS towards the end of the month. Stay tuned to the ACORN website (and enewsletter) for full details at http://www.acornorganic.org.